Enjoy my home, it is paradise here, would swap it for medical reasons only…. 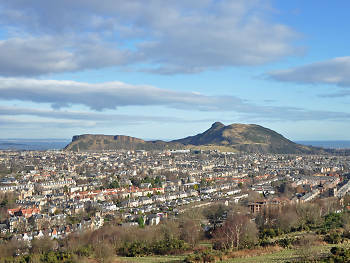 Not many cities can boast an extinct volcano at their centre – Edinburgh squeezes two into as many miles. Arthur’s Seat, visible from much of the city centre, rises out of the wide grasslands of Holyrood Park and, at just over 250m, it’s a relatively easy hike that offers unmatched views of the city skyline. On May Day it’s traditional for young women to wash their face with the hill’s morning dew to make them beautiful, though we’d argue it’s a bracing start to the day at any time of the year. 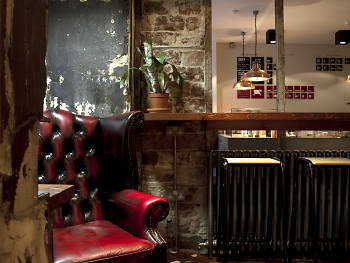 A stone’s throw from the foot of Arthur’s Seat, Hemma is one of the city’s five family-friendly Swedish-run bars (and the only one that lies outside of the Leith area). Their Arthur’s Breakfast is hearty fare suitable for anyone returning from a morning hike: haggis, bacon, poached eggs, sautéed potatoes, mushrooms, roasted tomato and a generous hunk of toasted bread from the local Manna House bakery. They’ll also mix you one of the most luxurious Bloody Marys in town if you’re in need of non-exercise-related recuperation. The long curve of Victoria Street swoops from George IV Bridge down to the historic Grassmarket, and is home to Edinburgh’s finest selection of independent boutiques. There’s hip fashion on offer in Swish and more formal, tweed-based couture in Walker Slater; designer homewares in The Red Door Gallery and Context; vintage hardbacks in The Old Town Bookshop and party tricks in the A-Ha-Ha joke shop; not to mention a range of foodie delights, from the distinctive whiff of IJ Mellis’ cheesemonger and the hog roast of Oink to the array of flasks and bottles in the windows of Demijohn and The Whiskey Shop. Adding a splash of science to your everyday espresso, Brew Lab’s high tech fittings wouldn’t count for much if they didn’t make such a damn fine cup of coffee. 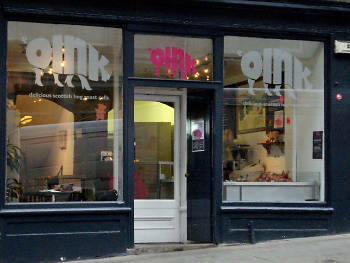 It’s also the perfect place to sample the wares of some other indie Edinburgh icons, including soup from Union of Genius and cakes from Lovecrumbs. 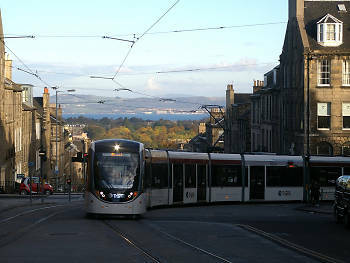 Coming in years late and millions of pounds over budget, the Edinburgh Tram system (in reality just a single route from the airport to the city centre) is something of a sore point among the locals. As such, it’s almost certain to be a topic of conversation in any bar or shop you visit along its route – make sure you have a go on it so you’re fully equipped for the debate. 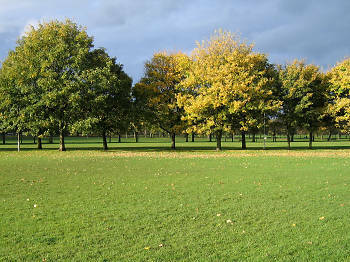 The large, leafy expanse of the Meadows lies in the shadow of Edinburgh University’s central campus, so it’s not surprising to see the place swamped with sunbathing students during the summer months. A relaxing, airy alternative the rushing traffic and labyrinthine wynds of the Old Town, the Meadows also connects the city centre with the calmer suburbs of the Southside, home to many a deli, cafe and boutique. 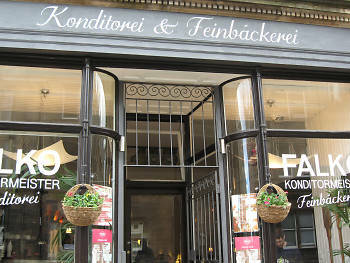 Among the Southside’s many trendy eateries, Falko: Konditormeister is one of the least precious about its food. Sturdy German breads and pretzels accompanied by wooden platters of cold meats and cheese make a basic but tasty brunch, and you can always peruse the more delicate cakes and gateaux if you’re still feeling peckish after. 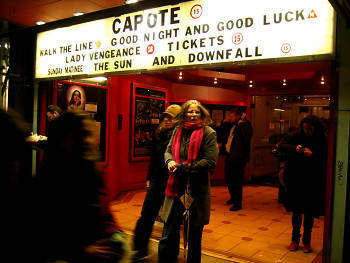 Apparently one of Quentin Tarantino’s favourite picturehouses, the Cameo Cinema has been operating under one name or another for over 100 years. Recently refurbished with some of the comfiest reclining cinema seats in town, it’s the ideal place to catch a well-curated season (usually focused on a specific director’s work) or special cinematic event (such as their legendary All Night Horror Madness marathon sessions). Even if you don’t fancy a film, the Cameo Bar is an easy-going place to sip a pint and eavesdrop on some serious cinephile chatter. 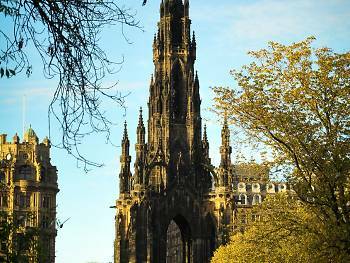 Its sooty spire a throwback to Auld Reekie’s polluted past, the Scott Monument (dedicated to the memory of Sir Walter Scott) is a gothic marvel puncturing the well-manicured greenery of Princes Street Gardens. Squeeze your way up its narrow spiral staircase for a breathtaking view that recently made an impression on the silver screen, making a cameo appearance in ‘Cloud Atlas’. Craft beers are a fairly commonplace sight in pubs and bars these days; less common are those brewed on the premises. The Hanging Bat’s selection is partially drawn from its own glass-walled microbrewery in the back of the bar; indeed, they’re so proud of their beer that they’d rather you savour it in 2/3 pint ‘schooners’ rather than thoughtlessly knocking back pitchers of the stuff. 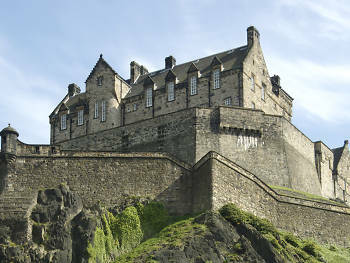 One of the UK’s premier tourist attractions, Edinburgh Castle is worthy of the attention: sitting boldly atop the city’s other extinct volcano, it’s a grandiose and constantly visible reminder of the settlement’s historic roots. Plan your visit to coincide with one of the Castle’s many actor-led historical tours – those old stone walls really come to live when it’s Robert the Bruce showing you around. 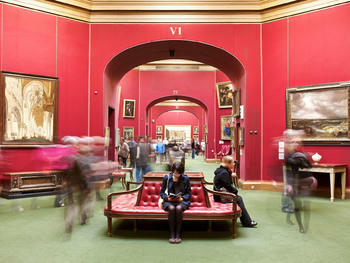 Whatever your artistic preference, there’s a Scottish National Gallery to suit you: the Greek columned National Galleries Complex is located right at the heart of the city, at the foot of the Mound on Princes Street; the red sandstone Portrait Gallery is nestled five minutes away in the New Town; and both Modern Art One and Two occupy the grassy area above the picturesque Dean Village to the west. Set aside an afternoon to absorb some resident masterpieces and visiting exhibitions. 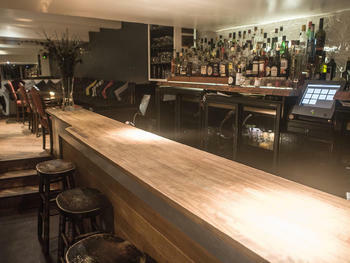 Regularly cropping up on worldwide Best Bar lists, Bramble makes a lot from a little: its packed basement premises can probably fit less than 100 people comfortably, but the expertly-curated cocktail menu ensures you’ll be rubbing elbows with the hippest of Edinburgh’s drinking set. Edinburgh’s not short on theatrical ventures – its annual hosting of the world’s biggest arts festival makes sure of that – but in terms of promoting Scotland’s best and brightest dramatic talent year-round, the Traverse leads the pack. 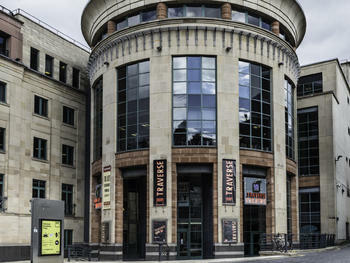 Proudly proclaiming itself ‘Scotland’s New Writing Theatre’, it’s the place to go if you want to witness fresh, thought-provoking performances, or if you just want to immerse yourself in the post-show hubbub of the Traverse Cafe Bar. 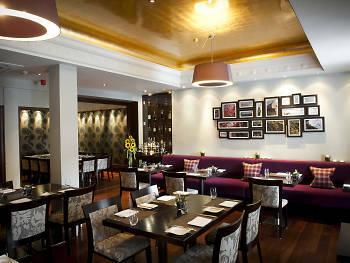 A definite destination for lovers of fine dining, Edinburgh is home to five of Scotland’s 16 Michelin-starred restaurants. The newest of these is Castle Terrace, a city-centre eatery with links to The Kitchin (itself the worthy proprietor of a Michelin star in Leith). Chef Dominic Jack’s signature dish is spelt risotto with ox tongue and confit veal heart – splash out and treat yourself to something sublime. 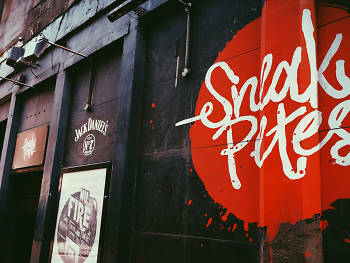 Despite suffering a series of venue closures over the past decade or so, Edinburgh still has a vibrant live music scene – you just have to know where to look. 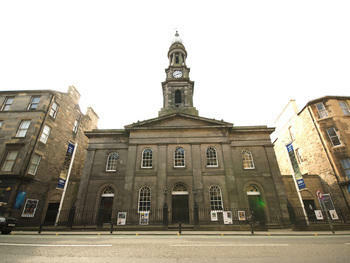 The high-ceilinged Queen’s Hall is probably the venue with the broadest scope of genre: in addition to hosting gigs as part of the annual Edinburgh Jazz & Blues Festival and being the permanent home of the Scottish Chamber Orchestra, it’s also welcomed Canadian pianist Chilly Gonzales, pop chanteuse Sophie Ellis-Bextor and grunge survivor Mark Lanegan in recent years. 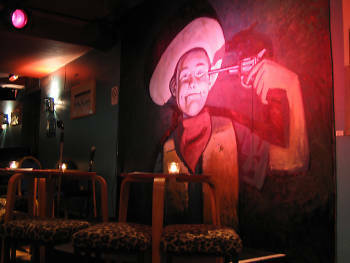 Rightly considered the leading light of the Scottish comedy scene, The Stand (which also has branches in Glasgow and Newcastle) is just as likely to have old hands like Frankie Boyle and Stewart Lee practising new material as it is rising stars treading the comedic boards for the first time. 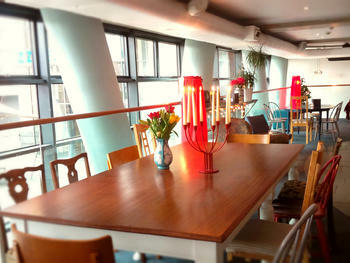 Keep an eye out for their Monday-night Red Raw sessions for a helping of both. The LCD Soundsystem-inspired murals that cover the rear walls of Sneaky Pete’s should clue you in that this is a club with impeccable taste. It’s open every night to crowds of 200 max, but don’t let the small size full you – with recent guests including The Juan Maclean and a residency by tastemaking Glasgow label LuckyMe, it’s probably the finest club in town. 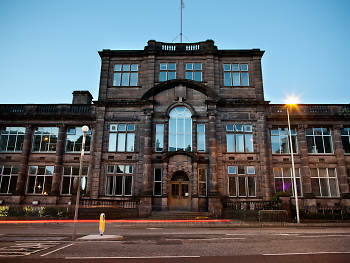 Art exhibitions, theatre performances, gigs, clubs, films, talks, workshops – there’s very little you can’t do at Summerhall, the multi-arts venue housed in a former vetinary school just off the Meadows. 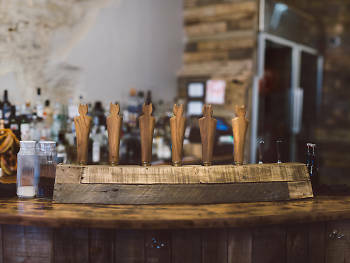 It even has its own microbrewery – the tasty and refreshing Barney’s Beer – which you can sip while enjoying a meal at the wood-panelled bar out back. 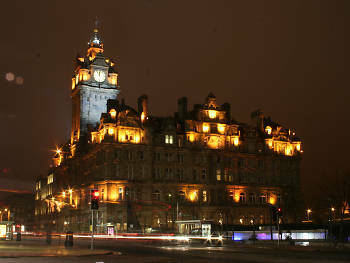 If you enter Edinburgh via the Waverly train station, the first sight you’re likely to see as you exit is the imposing bulk of the Balmoral hotel. Topped with a clock that allegedly runs a few minutes early so commuters get to their trains on time, it’s an old-school hotel that follows in the grandest of traditions – after you’ve stayed here once, you won’t want to fall asleep (or wake up) anywhere else. Palestinian youths throw stones during clashes with Israeli border police. WOW Stones DO kill you know! Shawish is a Palestinian with Israeli residency who lives in the East Jerusalem suburb of Shuafat. He met US Media in the middle of the day as he shopped on the main street of the affluent neighbourhood. It was a quiet day. Over the din of traffic, you could hear a bell ringing to warn of the approaching light rail transit train. At night, Shuafat has turned into a place where violent confrontations between young Palestinians and the Israeli security forces have broken out frequently in the past four months. Palestinian rioters have also smashed ticket machines at LRT stops. They’re now covered by sheets of metal. Many of the traffic lights no longer work, as the power cables have been cut. For many Palestinians, this is a new kind of struggle, an uprising without leadership, where individuals are moved to act against the Israeli occupation and policies. These attacks, along with the frequent outbreak of clashes between Palestinians and Israeli security forces, have led to a great deal of discussion here about whether a third intifada is underway. Mustafa Barghouti, a member of the Palestine Liberation Organization, said there is little doubt that another uprising has begun. “What is happening today in the occupied Palestinian territories in response to occupation and oppression is a popular, mainly non-violent resistance in the form of demonstrations,” Barghouti said. He says because of the anger, he understands why some Palestinians have chosen violence. Above is from the America media. I am not even surprised by it’s one sidedness. It is an outrage but again, is anyone surprised? Isreal blew up Gaza’s ONLY powerstation in July and charged Gaza’s for fixing it then put prices up. When will the World realise that Palestine is land locked? These people can’t all go elsewhere. They are up against probably one of the top 5 War machines on the planet. This is David Vs Goliath if we want to quote stupid scripture that keeps Israel ok. People say “Oh but people want to destroy Israel” That won’t happen, there are over 100 Nuclear sites and protection sites around Israel that belong to the Israeli’s or America. America is the ONLY Country in the Word to back Israel this much. American people back Israel while the rest of us human beings with a bit of humility can see past religious hatred and understand all the propaganda to make Israel look innocent. This should be a UN cause and I think it really will be one day. Israel can’t keep treating Palestine like a Zoo. When will our World wake up to the evil that is ‘Organised Religion” and the harm it does? Have Labour learnt nothing? Check this! MP’s from England phoning Scottish LP members to ask them to vote Jim Murphy as leader, they are delusional, have they Learned nothing ? After interviewing the candidates yesterday, GMB have today announced that they will be backing Neil Findlay to be leader of the Scottish Labour Party and Katy Clark to be deputy leader. This makes GMB the seventh trade union to back the two candidates, and it is a particularly interesting announcement as earlier in the week there were suggestions that GMB would come out to back one of the other leadership candidates, Jim Murphy – which is also the union that he is a member of. Harry Donaldson, GMB Scotland Regional Secretary explained the union’s decision: “After having gone through a thorough process in which all candidates for the Leader and Deputy Leader were interviewed, the lay member-led Scottish Regional Committee decided to support Neil Findlay and Katy Clark for leader and deputy leader. This is the latest from the ongoing “Field Office” leadership for Labour in Scotland. I don’t think Labour realise that the Scottish people actually don’t like them any more. Labour thought Scotland was stupid, now Scotland know Labour are Stupid. They sold their souls to the Tories. For that! There is no come back. Expect a HUGE surge in the region of 70% SNP PM’s in Hollyrood next year. The thrashing labour will take in the election will be swift and hard, but they deserve it. Now they are calling Scottish people from England. Scotland’s Labout leader and her Deputy have resigned, Johann Lamont to be fair said it as it was, she admitted London Labour no longer look to Scotland for votes. I wonder how Ed Milliband feels knowing he has lost the Scottish vote and the dynamics of Scottish Politics have been changed for EVER! ARE YOU STUPID ENOUGH TO FALL FOR LABOUR LIES AGAIN? OH DEAR, GORDON, WHAT HAVE YOU DONE! Jim thinks it’s ‘COOL’ to have Nuclear weapons on Scottish soil but not in England. Monday 13 February 2012 was a day I as a Celtic fan look back to and remember the fun and joy we all had. The coffin the 4 horsemen of the apocalypse, everything was just brilliant. It was a time where Celtic were doing well, good times were here and were about to get better, it was a brilliant time to be a Celtic fan. Monday 13th February 2012 is the day Craig Whyte admitted he had refused to remit the pay-as-you-earn tax deducted from his employees to HMRC, told Edinburgh Court of Session he was giving his notice of their intention to appoint administrators for Rangers FC as we knew them, into Administration. This was the day Rangers died, forget every other event, this was the moment that killed them and to this day still is killing them, and one day soon will see Ibrox and other assets taken by one man who seemed like a knight in shining armour and they will finally be laid to rest. But make no mistake, Craig Whyte’s ability to appoint Duff & Phelps was the day Rangers died, this appointment brought the story to where it was today. Had it been the Blue Knights, it wouldn’t be the story, I think we all know this. What Mr Whyte and through Duff & Phelps did was start a chain of actions that led us to this day, a day where Sevco breath, just, but it could have been oh so different. So now Mike Ashley has Ibrox, Murray park and Albion car park as collateral for his £3 Million in loans to keep ‘The Rangers’ breathing . Many have pointed Edinburgh as being the place where Rangers died, or the decisions were made to make them die. They had to die, the debt would take them under. These days they are called Sevco and not unsurprisingly by the Scottish Media, the same Rangers of old. They got to keep readers and viewers right?